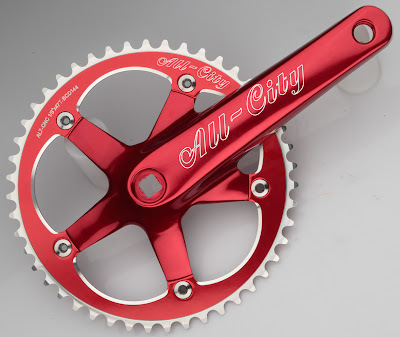 Cranksets will be available in Black, Silver, Red, and Gold; and will come with a 47 tooth matching chainring. They will be available in 165mm and 170mm lengths. They are super stiff and should be plenty tough enough for the street. We will be selling the chainrings in 47, 45,43, and 42 teeth, and will have black, gold, and red available. 47 & 43 teeth, woot! I'm glad folks are finally understanding prime numbers and their importance regarding lots of skid patches! Burd et al at Bootleg - now I know where you guys got the inspiration for all the tricks on your DVD. Ines Brunn who?! Actually, we get all of our inspiration from this. (traitorcycles.com & alienbikes.com) Another company trying to capitalize on a hipster fad instead of providing innovative and original components! I'm lovin' these. When do you think the'll start pumping these bad boys out and how much? ?